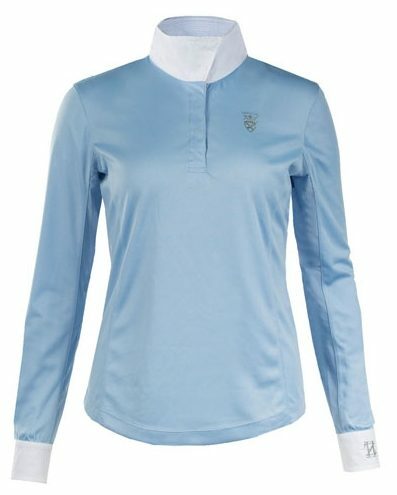 Looking for affordable sophisticated riding shirts that are functional and breathable is pretty difficult until I came across the HorZe Blair Long-Sleeved Functional Show Shirt and fell in love! 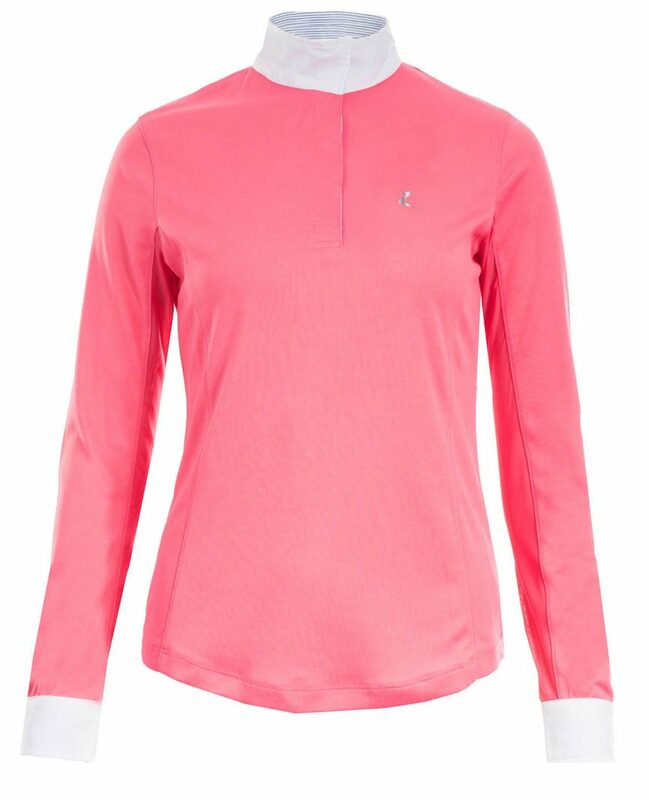 Main fabric: functional 100% polyester Nanotex® fabric, UV protection UPF 30+. Mesh details: polyamide/elastane, woven details: 100% cotton. 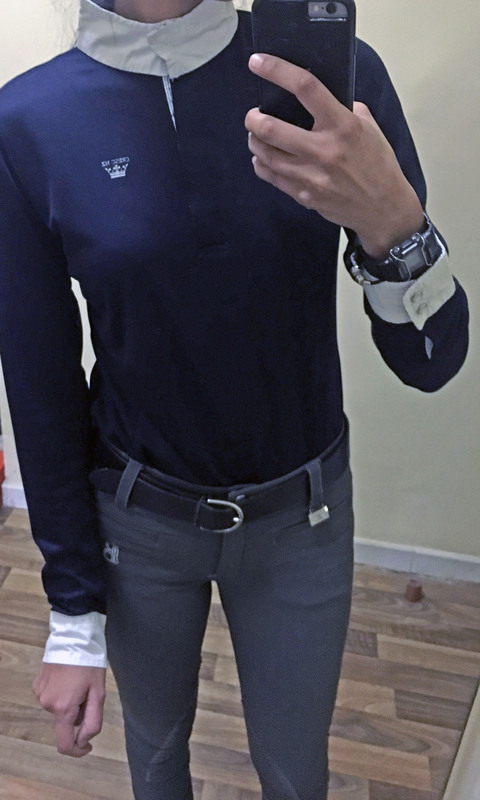 I have been using my Blaire shirt for training for the past few months and absolutely love it. 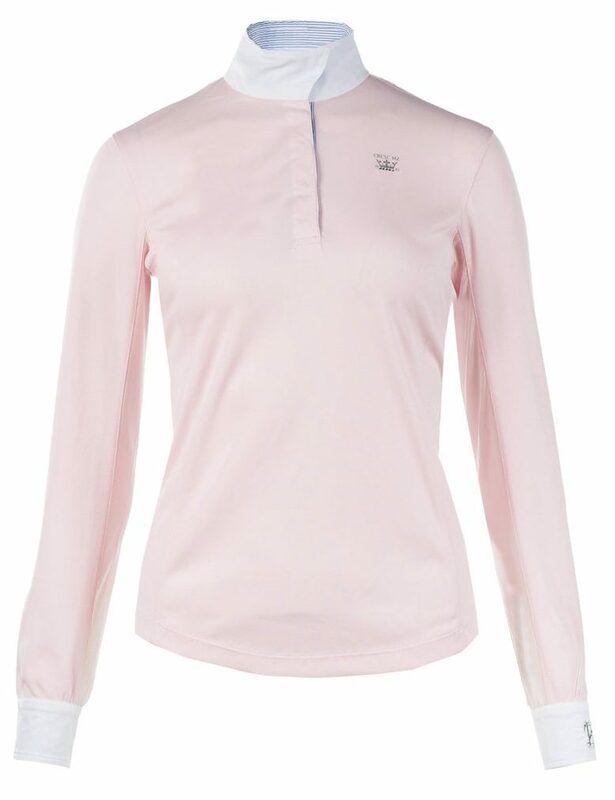 It not only looks neat and elegant, but is also breathable and lightweight. The material has UV protection, making it great for the summer. The arms are very slightly too long and a bit baggy, but I prefer to have that freedom of movement. 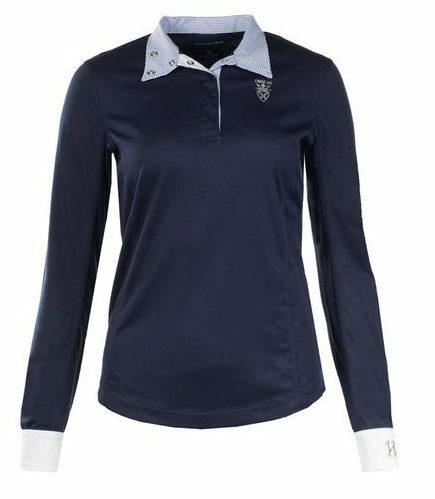 I do find the top to be slightly short, coming out when tucked in while wearing low rise breeches. They are fine on mid or high-rise breeches though. The detailing and structure is impeccable, with pearl like buttons on the cuffs and an elegant cut. The collar can either be worn as a high neck for shows or a collar for training. 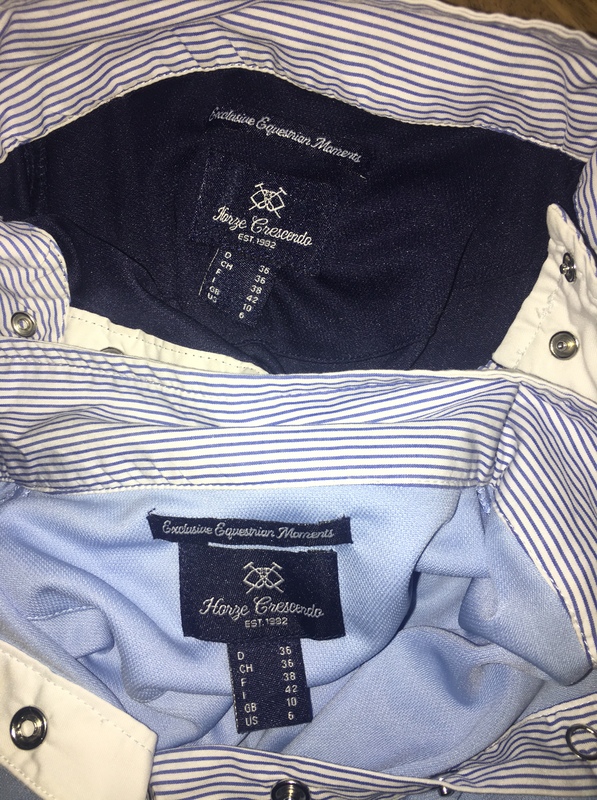 This versatility allows for the usage of the shirt in the show ring or riding arena. 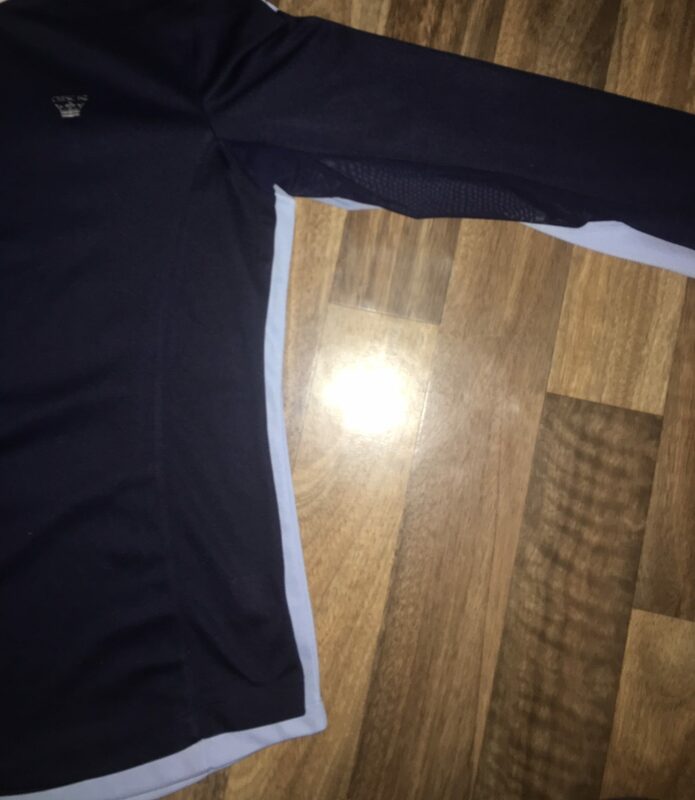 The inside of the collar has blue lining for all the shirt colours. I am personally a big fan of the metal press buttons rather than the traditional ones as these are much easier to open and close. The inside of the arm is includes a mesh material which allows for air flow and quick dry. I have been using this for months and the mesh is still very intact. The good thing is that the mesh is hidden and barely shows unless someone is really paying attention. This I find is positive as it gives it a more professional look. 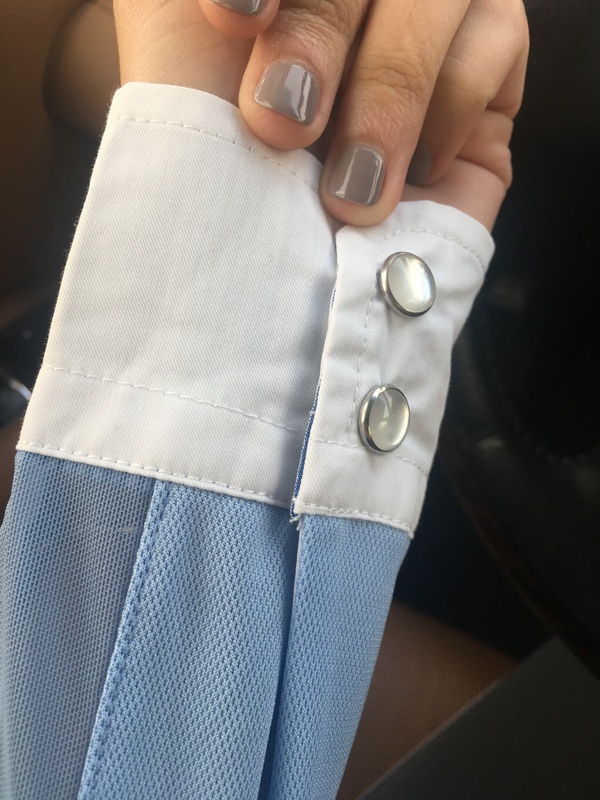 That being said, sweating is inevitable in UAE’s heat so even though this does keep me cool, sweat marks still show on the baby blue colour but not the navy. 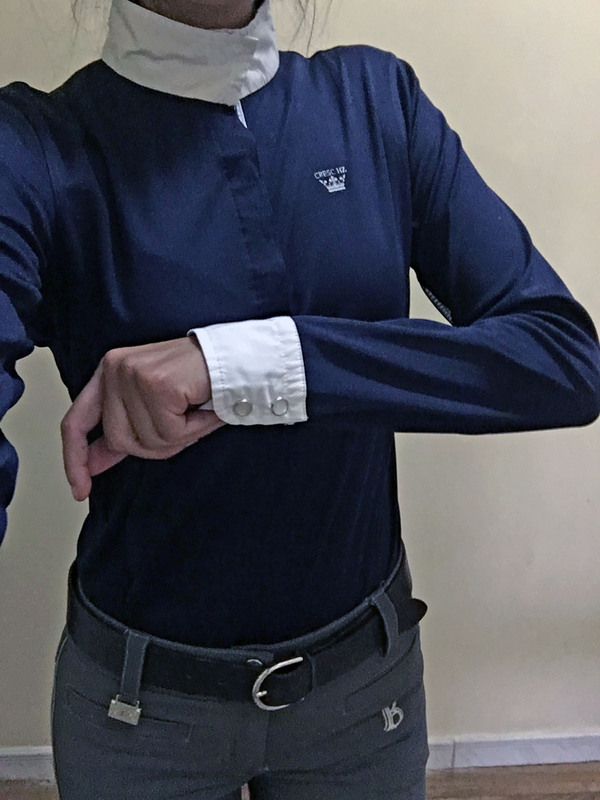 On the other hand, I realized there was a difference in size with my Navy and my Baby Blue colour. The baby Blue came somewhat wider and bigger than the Navy even though they are the same size. This makes the baby blue colour more a more boxy shape and a bigger fit than the navy. This is disappointing honestly as it shouldn’t be the case. Especially when it comes to riding, you feel every difference in riding and moving around. Generally I wouldn’t mind, but it really does feel less comfortable and the fitted navy especially on hot humid days. Verdict: I would recommend this shirt as it is truly great value for money. Absolutely love it and I am planning on getting them in additional colours. HOWEVER, I would suggest trying them on before purchasing, even if you already know your size.